STORY: Chief of India’s ruling Bharatiya Janata Party (BJP), Amit Shah said that all illegal migrants are like ‘termites’ while addressing an election rally on Thursday (April 11). 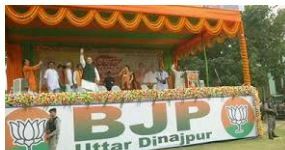 Shah was rallying in Uttar Dinajpur district of India’s eastern state of West Bengal when he made the statement. He was referring to illegal immigrants from Bangladesh. The party chief called them ‘a threat to the security of the nation and vowed to ‘throw them out’ after coming to power for a second term in a mammoth election that began on Thursday. Hundreds of thousands of people fled to India from Muslim-majority Bangladesh after it declared independence from Pakistan on March 26, 1971, setting off a nine-month civil war. Most of them settled in West Bengal and the neighbouring state of Assam, where there are similar demands to send back illegal Muslim immigrants.